One of the common comments I hear from people in Langley is that transit service is subpar. 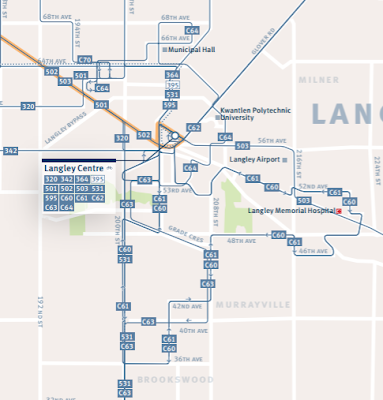 While transit service is currently subpar in the Township of Langley, especially in Willoughby and Walnut Grove, the same can’t be said in Langley City. Langley City had a population of 25,888 in 2016, and is served by 14 bus routes. One route, the 502 which runs along Fraser Highway, is part of the frequent transit network. This means 15 minute or better frequency all-day, every-day, with 5 minute frequency during peak periods. Most other routes through Langley City run every 30 minutes, with more frequent service during peak period. A map of the bus routes in and around Langley City. To put this into perspective, my hometown of Vernon with a population of 48,073 is served by 8 transit route with the most frequent routes running every 30 minutes. In 2016, Langley City residents contributed $2.7 million in property tax to TransLink. TransLink also collected a portion of gas tax. While I don’t have the gas tax numbers from Langley City, it is likely in the neighbourhood of $3 million based on the ratio of taxation collected by the agency. So about $6 million in revenue was collected from Langley City residents in 2016. What services did we receive? Langley City received $759,313 directly from TransLink in 2016. This money was used to maintain the major road network which includes 200 Street, and to fund portions of other projects such as 203 Street. This totals to around $20 million in bus service provided through Langley City. These routes also serve the Township, Surrey, and White Rock. The numbers shows that we are getting a good deal when it comes to transit service through Langley City. A new Fraser Highway B-Line is coming in the next few years which will go to Downtown Langley. Rail rapid transit is also in the works to Downtown Langley. Langley City is a regional centre in Metro Vancouver, and this is evident in the level of transit service we receive in our community.